Side note – Switzerland is such a small country, yet there is so much diversity! French, German, and Italian are all spoken here. The Meier family speaks Swiss-German. Apparently those that speak Swiss-German can understand German, but those that only speak German cannot understand Swiss-German. Sneaky! I can’t imagine traveling to a different corner of Iowa and not being able to communicate with people! While visiting we got to tour their farm. I will be the first to admit that I don’t know much about farm life, but that doesn’t mean I wasn’t thoroughly interested and taken with some of their calves. 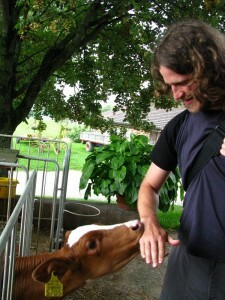 The family had 30 head of cattle, which I gathered was a pretty typical size for a Swiss dairy farm. Of course, some of the cows wore bells! It was so musical to listen to, although I wondered if the cows were ever annoyed by their own movement. They also have pigs, which I am not so keen on; but the piglets were certainly cute. 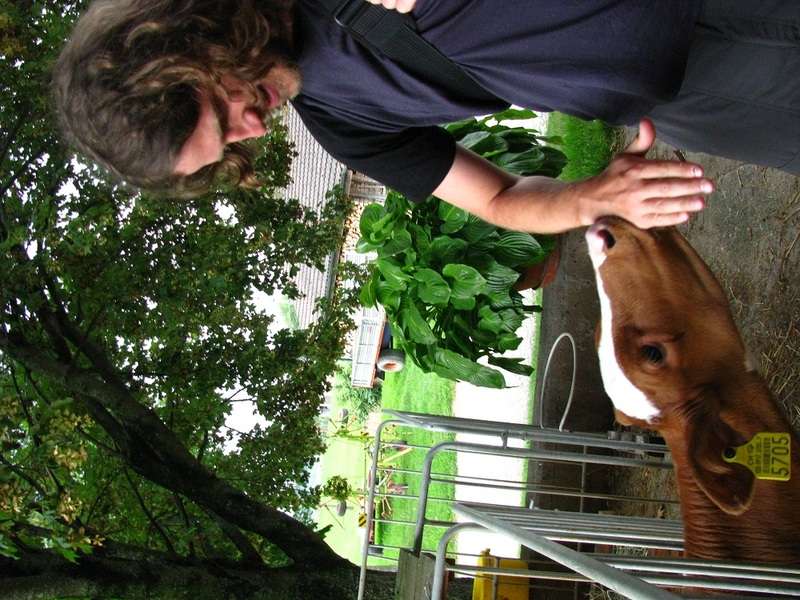 We learned that the Swiss maintain some strict laws to protect farm animals. For example, farmers may not cut off pig’s tails nor brand cattle. They also cannot feed cattle silage. Aspiring farmers go to school and apprentice with a farmer for three years. I really appreciated the intimacy of their operation. Each cow had a name and its milk output was carefully recorded and tracked in the computer. When we return to the states I will be interested in visiting a larger dairy operation to see how things are done differently. We were so thankful for the Meier family’s hospitality, generosity, and the opportunity to spend some time in rural Switzerland. Written by: recklesswonder on August 7, 2011.